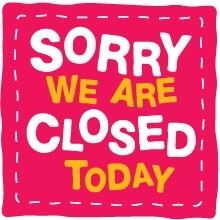 We are CLOSED ALL DAY TUESDAY! YES…someone hit a pole on Chalfont Xmas Eve and as a result of the transformer blowing we are closed all day today. Our breaker box caught on fire….and grateful that the building didn’t go up in flames. Add to that….Verizon never reconnected their lines to the pole. It's Wednesday 12:31 PM — BOOYAH...We're open!